Adelaide - Australia's Josh Hazlewood believes his side's recent success against India will give them a psychological advantage when they face the reigning champions in a World Cup semi-final in Sydney on Thursday. India may be unbeaten at the World Cup but they failed to win a match in the preceding Test and one-day tri-series in Australia. "We have obviously played them a lot this summer in both formats," said Hazlewood. "I would say we have the wood over them a little bit in that regard, winning the tri-series." The 24-year-old fast bowler has featured in just three of Australia's matches at the World Cup so far but made the most of his latest recall with a man-of-the-match return of four for 35 in a six-wicket quarter-final win over Pakistan at the Adelaide Oval on Friday. New South Wales paceman Hazlewood said he feared his World Cup was over when Australia's selectors opted for Pat Cummins before dropping his fellow seamer following an unimpressive return of three for 42 in seven overs against non-Test side Scotland. "Yeah, those thoughts do run through your head," Hazlewood said. "But you try and stay positive. "Patty obviously picked up a few wickets but had a bit of a mixed bag in the game last time, so left the door a little bit ajar I guess." 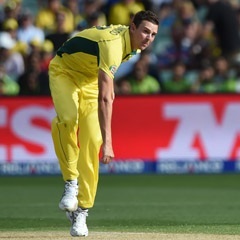 But the contest between Hazlewood and Cummins for a place in an Australia attack led by in-form left-arm fast bowler Mitchell Starc may still have some way to run at this World Cup. Australia's selectors have tended to opt for Hazlewood when wanting additional new-ball firepower and gone for Cummins when they've felt a need for greater variety in the 'death overs' late in an innings. "It has obviously been a toss of the coin job for most of the tournament between me and Pat, we have got the nod in different spots and in different conditions," said Hazlewood. "So it was just good to get another game and hopefully impress." He added: "I bowl a lot up front with the new ball and swing it around and try and take a few early ones (wickets). "And obviously with Pat, you can use him more in the powerplay and at the end with his change of pace and his yorkers and bouncers, he has got a bit of extra pace and you can use that in those different times."